The North Dublin Rotary Club wishes to support the ideal of Environmental and Wildlife awareness through Science and invites schools and science teachers in particular, to promote the participation of their students in this Young Ecologist/Environmentalist Discovery Challenge. The YEEDC is a pilot project promoted by Dublin North Rotary and aimed particularly at Transition Year classes. It is also open to students in other educational institutions who wish to apply and compete. The competition will be run in partnership with sponsors, including Forest Friends Ireland, and is intended to involve individual students in an active learning experience through a practical project, investigative research and practical presentation. The competition is open only to students between the ages of 16 and 18years on June 30th 2013. The YEEDC, at it's initial stage, is part of the environmental educational programme of Dublin North Rotary. Following on the pilot project, it is hoped that it will be rolled out on a Rotary district, all Ireland, basis. Other Rotary clubs are welcome to use the format to suit their own needs and Dublin North Rotary welcomes feedback and comment which would help develop the concept further. You can download competition details and an entry form from here. 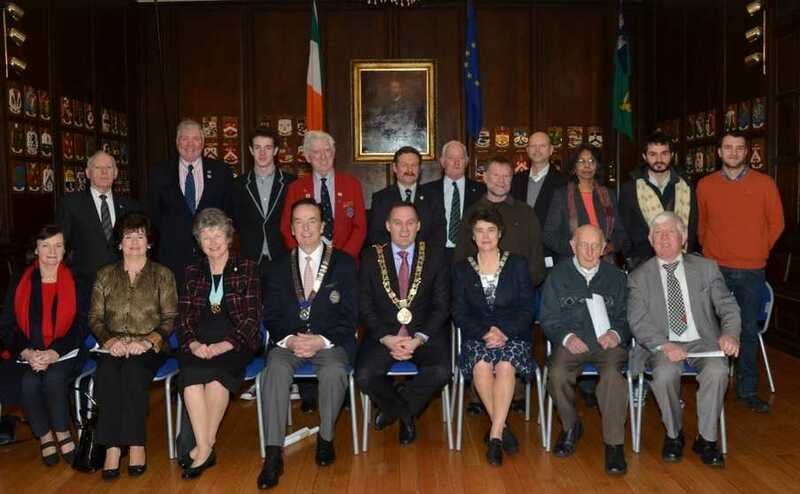 Jack Cunningham District Governor of Rotary Ireland, Dublin Lord Mayor and Una Kane President Dublin North Rotary Club with members of Dublin North Rotary and Forest Friends Ireland at the launch of the YEEDC 2013.